‘It’s legal, but is it legitimate?’ and ‘It’s legitimate, but is it legal?’ These are questions rarely discussed in public concerning architecture and urban design. Yet architects have to deal with rules and regulations, and architecture is to a large extent defined by them. So the question is: how to deal with the law? 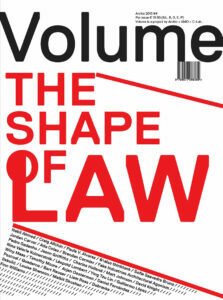 Throughout the pages of this issue, we’ve explored different strategies for dealing with legal problems, whether that be through a direct fight or indirect action, through avoiding, subverting or changing the law. Because in the end law is too important to be left to lawyers. Includes contributions by Nabil Ahmed, Craig Allchin, Paula V. Álvarez, &\also thinktank, Sofia Saavedra Bruno, Jordan Carver, Ada Colau, Brendan Cormier, Fake Industries Architectural Agonism, Pedro Gadanho, Jason Griffiths, Charles Holland, Matt Johnson, David Knight, Nina Valerie Kolowratnik, Léopold Lambert, Ying Tzu Lin, Guillermo López, Winy Maas, Timothy Moore, Arjen Oosterman, Daniel Fernández Pascual, Quaderns, Bart Reuser, Liam Ross, Dubravka Sekulić, Louise Shannon, Malkit Shoshan and Finn Williams.